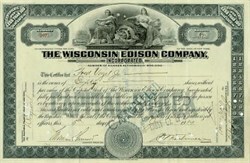 Beautiful engraved stock certificate from the Wisconsin Edison Electric Company issued in 1914 - 1923. This stock certificate is bordered by a green ornate pattern and has a vignette of two Allegorical woman sitting next to a power generator with old electric trains in the background. This is a nice looking document and it is over 79 years old.